Here at Hummingbird Lane Fabrics we strive to provide personalized service to our customers. If you have trouble finding what you are looking for just let us know and we will gladly help you out. 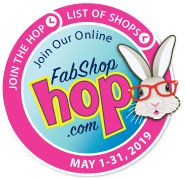 This May, for the first time ever, we will be participating in the FabShop Hop! The FabShop Hop is an online fabric store hop where you go to different fabric stores online and search for the bunny; it looks similar to the picture above. And when you do find it, you click on it and get entered into the Giveaway for the month. The prizes are amazing! There is a grand prize, a first place prize and then several entrants will get a $10 gift card to spend at the participating shops. Sounds fun right?! Come back on May 1st and start looking for that bunny. Click the bunny up above or go to www.fabshophop.com to get more details. Pairing rich, elegant, vintage patterns with colors that are contemporary provides an on-trend look to this timeless theme, Deb Strain’s Bee Joyful is stunningly BEE-utiful! Don’t miss out on this gorgeous collection. The Meadowlark collection by Dena Designs is like strolling through a garden listening to the sweet sounds of the songbirds. A lovely mix and match collection perfect for any project that will add a little whimsy and a lot of style to your next sewing project. Inspired by her experience as an exchange student in Japan, Corinne Haig has created this masterpiece collection. Peony Pagoda transports us to the land of Japan with pagodas and bridges all with a watercolor design. You gotta see this gorgeous collection, including this fret trellis pink print.